I can happily share that I have completed my 2nd weekend of Pilates Reformer teacher training… yayy! It was another long but fun & informative weekend, diving deeper into the incredible teachings of Pilates on the reformer. Weekend I was spent learning the in’s & out’s of Tier I & II, leaving Tier III for our second weekend of training. Just when I thought I was falling in love with this new-to-me method of movement, Tier III had me falling all over again. Tier III is no doubt more my speed. Naturally, a progression of Tier I & II, Tier III has about double the amount of exercises + more challenging, advanced versions of the moves from Tier I & II. A couple photos of 2 exercises from Tier III. Coming soon, a couple more posts on 1) why I’ve fallen in love with Pilates 2) why I’ve decided to add Pilates to my life & training. 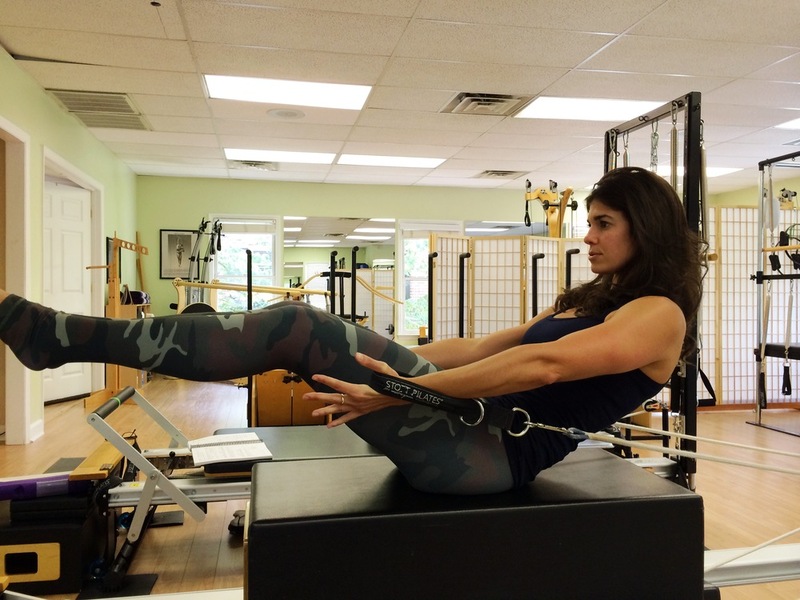 This exercise performed on the box on top of the carriage takes so much focus and crazy core strength & stability. My abs were sore for 2 days after this. amazing. Fun variation of Side Splits. Previous Post Coffee Talk: Decaffeinated.